This product is a high-performance and fashionable design power station. 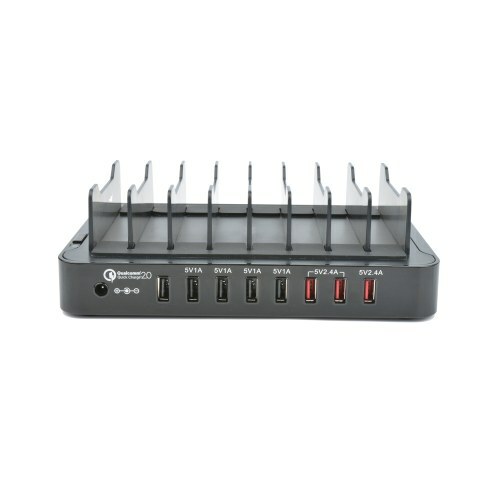 It is equipped with eight USB connectors for output interfaces. 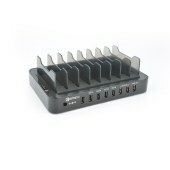 This product allows several devices to be charged at the same time. Industrial-grade plastic outer shell and premium case ensure lifetime reliability. Input voltage idea for international travel, the unique design makes your life simpler and easier. Internal chip allows the 120-240VAC of input voltage. USB1: Comlaint with QC2.0 automatically adjusts power outputs of 5V/2.4A, 9V/2A, and 12V/1.5A for charging fast and safety. USB2~USB3: Every port provides 1A output for android phone. 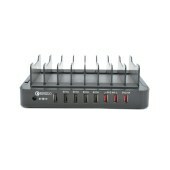 USB4~USB5: Every port provides 1A output for iphone. USB6~USB8: Every port provides 2.4A for other smart phones, with intelligent IC to auto detect their output requirements. Short circuit protection and over load protection. Beautiful, portable and convenient to use.